Jannus, Inc. is an Equal Opportunity/Affirmative Action employer that values diversity in the workplace. Jannus, Inc. shall abide by the requirements of 41 CFR sections 60-1.4(a)(7), 60-300.5(a) and (d), 60-741.5(a) and (d), and 29 C.F.R. Part 471, Appendix A to Subpart A, if applicable. These regulations prohibit discrimination against qualified individuals including on the basis of race, color, religion, age, gender, pregnancy, national origin, mental or physical disability, genetic information, sexual orientation or gender identity, veteran status or disability, military status, or any status protected by federal, state or local law and require affirmative action by covered prime contractors and subcontractors to employ and advance in employment women, minorities, qualified protected veterans and individual with disabilities. If you are having trouble applying and need accommodations for disability purposes, you may call 208.336.5533 and speak to our Human Resources Manager. Reader from the Adobe website to view the full job postings. Jannus Is currently accepting applications for the following open positions. ESL Instructor, English Language Center (ELC), Boise, ID - The English Language Center is a program housed in the Idaho Office for Refugees. Classes tackle English challenges that students face on a daily basis; from going to the store, to making an appointment, to filling out a job application, to having a conversation with their neighbors. The ELC focuses on holistic language acquisition to combine language skills with critical thinking techniques to teach students how to use the tools they already have in a new environment. As part of the ELC, this position is responsible for teaching multilevel English language classes for adults utilizing trauma informed service practices. Project Assistant, Economic Opportunity, Boise, ID - The Starling Project seeks to create an intentional community of women leaders through mentorship and curated programming. Under the supervision of the Starling Project manager, the Project Assistant will provide support to young-adult refugee women’s mentoring program. Support includes providing logistical coordination for educational events, creating opportunities for participants to connect in the community, developing and supporting organizational systems for accurate program evaluation and assisting with implementing a Starling Alumni project component. This position is 15 hours per/week. Jannus has been honored with the 2011 Alfred P. Sloan Award for Business Excellence in Workplace Flexibility for its use of flexibility as an effective workplace strategy to increase business and employee success. We are so pleased to have been selected for this honor! 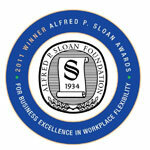 For more information about the Alfred P. Sloan Award, go to the When Work Works website at www.whenworkworks.org.